Originally in Colorado as early as 2003, this is a newly recognized disease (2008) of primarily Black walnut (Juglans nigra) and caused by a fungus (Geosmithia morbida) that is vectored into the tree by the walnut twig beetle (Pityophthorous juglandis). Primarily black walnut, but Arizona walnut, English walnut, and California walnut have all shown varying degrees of susceptibility to this fungus. Fungus is spread by a native insect. Most likely pathway for movement is raw wood—logs, burls, stumps, firewood, wood packaging material, nursery stock, scion wood for grafting, and natural spread. 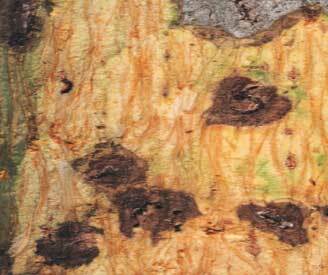 Fungus kills a localized area in the phloem just under the bark in >2cm wood after introduction. These dead areas often overlap or coalesce from numerous strikes (35 insects per square inch of wood) causing nutrient disruption to foliage and thus leading to branch dieback. Early symptoms are yellowing of leaves and foliage thinning of the upper crown of the tree. No known infestations in Nebraska. Confirmed (2012) in Washington, Oregon, California, Idaho, Utah, Colorado, Arizona, New Mexico and now, Tennessee) and is thought to be widespread. Currently there are no known insecticide sprays that reliably control this disease. Some techniques directed at the vector ultimately may prove to be useful in suppressing the rate of disease spread. However, it may be unlikely that effective treatments will be found that can control walnut twig beetles once tree attacks have begun. 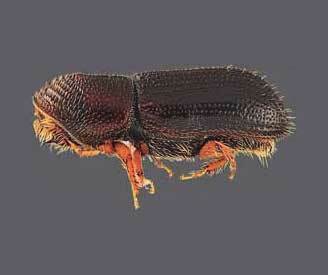 Control of walnut twig beetle by use of drenching trunk/branch sprays of insecticides (permethrin, bifenthrin) is a technique used successfully against some other bark beetles (e.g., mountain pine beetle, Ips beetles). 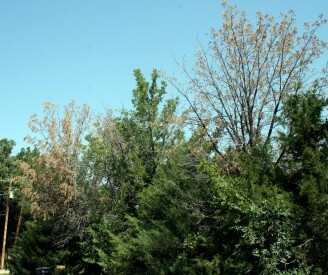 However, infested black walnut trees that have received repeated insecticide spray treatments by arborists in Colorado are observed to continue to decline and die. This method appears to have only limited effectiveness, at most. The use of soil applied systemic neonicotinoid insecticides (e.g., imidacloprid, dinotefuran, clothianidin) is a possibility for bark beetle control and there has been some attempts to use imidacloprid (e.g., Merit) for this purpose. Anecdotally these treatments seem to have had negligible effectiveness. Researchers report that the disease may be suppressed by soil applications of imidacloprid if they are applied before the disease has become well established in the tree; treatments made after symptoms begin to appear are ineffective. Learn more here.